This modern reboot of an 80’s classic has taken the cosplay community by storm and now everyone wants to become a Paladin. Do you have what it takes to pilot a Lion and defend the universe? Take a look at some of our wig suggestions below and find out! The leader of the group, Shiro is calm and always in control. Both our Hermes and Aether styles are short, layered wigs that can be cut shorter to match Shiro’s unique style. To achieve his signature tuft, either add on one of our 15” wefts or clipon bangs in white and style to match. The lone wolf Keith is sullen and temperamental. For minimal styling, our Aura style would be the best choice as this shoulder length style already has a bit of a natural curve to it, and shorter bangs that can be tousled to resemble Keith’s messy hair. Our Helios style is a little longer and requires some trimming in both the length and the bangs, but can be curled on the bottom with heated styling tools to achieve the same flip. Cocky and confident, Lance is the class clown of the group. Our Hermes style can be worn as is for him, and if you’d like to get a little more hands-on you can trim the bangs and sides of our Aether style to more closely match his look. The tactical genius Pidge is the youngest and smartest of the Paladins. You can tease and style our Aura style in the back to recreate his fluffy, flyaway style, or do the same to our Helios if you’d like a little more length and volume. Tousle the bangs to finish off that disheveled nerdy look. A gentle giant with an equally large appetite, Hunk is the heart of the team and a true bastion of justice. 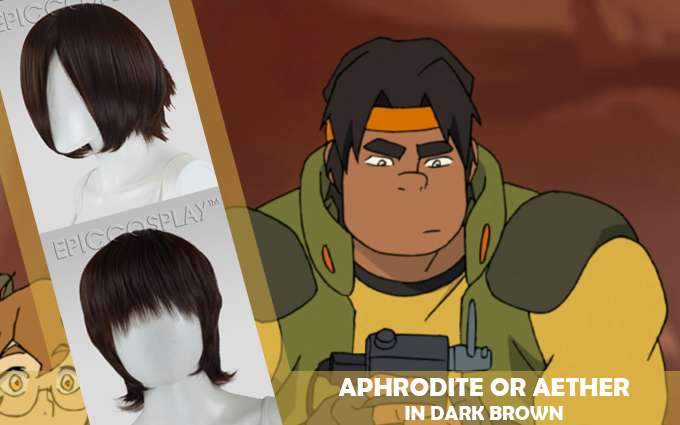 With a little heat, you can style our Aether style’s bangs to be parted down the middle and slip on a headband for a quick and easy Hunk cosplay, or, if you’d like longer bangs, you can trim our Aphrodite style for some extra length in the front.